Chuckit Ultra Ball Launcher is 2.5" ball compatible. 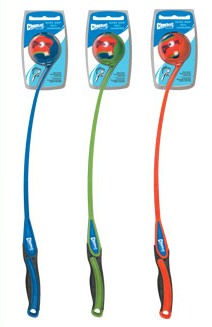 The Chuckit Ultra Ball Launcher is so named because it is designed to give ultra grip. The rubber grip handle provides comfort, control and a stylish touch. This marks a new premium of the product line and maintains the same great benefits of the original Chuckit dog ball thrower. 25 inches long. Comfortable ergonomic rubber grip handle. 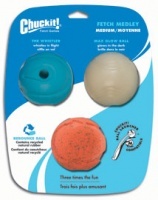 The Chuckit Ultra Ball Launcher takes standard tennis balls or 2.5" Chuckit dog balls. Click here for our selection of dog balls. Form supports your throw just nicely. The curve is just flat enough not to hinder you but deep enough to allow for some purchase. Material is stout but flexible. Grip is soft and prevents bruises you'd get from other launchers with no protection. Wow this thing flys a ball. My lurched can just keep up with it. Very professional service from start to finish. Will use again. Dogs love the speed and distance the ball will fly from this launcher. D for dog site is excellent too. Chuckit balls go for miles from this ball launcher. It does what it says on the tin!